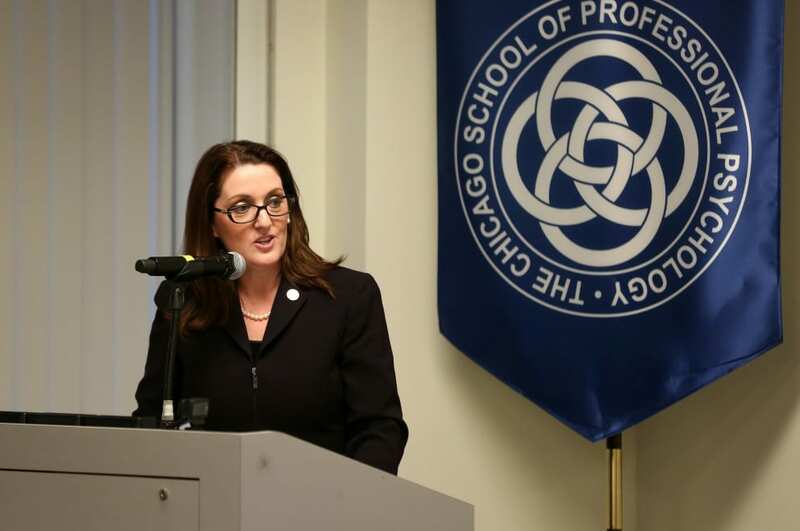 As President of The Chicago School of Professional Psychology (TCSPP), Dr. Michele Nealon leads one of the most successful non-profit professional graduate schools in the nation, directing campuses across the country that educate more than 4,300 students in the fields of psychology and related behavioral sciences. Since taking office in July 2010, Dr. Nealon has led the development of innovative new programs, shaped a forward-thinking strategic plan that positions the school as a national institution with global reach, and presided over the opening of a successful new campus in Washington, D.C., among other achievements. During her tenure, TCSPP continues earning national recognition for its work in the community. In 2013, the school’s Chicago Campus was named to the President’s Higher Education Community Service Honor Roll by the Corporation for National and Community Service for the sixth consecutive year, and for the first time, the Los Angeles Campus also received this distinction. In 2012 alone, TCSPP students provided more than 85,000 hours of high impact community service in local communities. Prior to assuming the institution’s top leadership position, Dr. Nealon served as the first president of The Chicago School of Professional Psychology’s Los Angeles Campus, overseeing its growth from inception as well as affiliate branches in Westwood and Irvine, California. An alumna of the school’s doctoral program in Clinical Psychology, Dr. Nealon later served as a faculty member and chair of the program at the Chicago Campus before moving to California. In 2006, Dr. Nealon received the institution’s Distinguished Teaching Award in the area of public service teaching, and is an accomplished writer and speaker on a wide range of psychology-related topics. Dr. Nealon’s distinguished career reflects her dedication to ensuring that underserved populations receive the mental health care they need and deserve. She began her career in clinical psychology in Dublin, Ireland, before moving to the United States in 1994, where she worked with adolescents in group homes and foster care for more than six years. Furthermore, her clinical experience includes a variety of clinical settings with diverse groups of people including inpatient, outpatient, community mental health, forensic, and academic settings. As a licensed clinical psychologist, Dr. Nealon specializes in the treatment of children, adolescents, and their families. In addition to the Clinical Psy.D. Degree from TCSPP, Dr. Nealon received a B.A. and M.A. from University College in Dublin, Ireland. Dr. Nealon regularly blogs on the Huffington Post. Follow Dr. Nealon on LinkedIn.